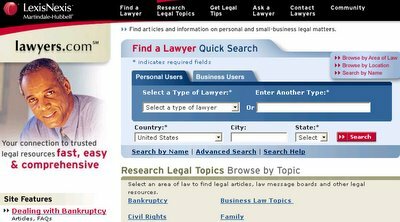 In its 18th citable decision of 2005, the TTAB affirmed a genericness refusal of the term LAWYERS.COM for "providing an online interactive database featuring information exchange in the fields of law, legal news and legal services." It took the Board 29 pages to explain this seemingly inevitable result (and this posting will not attempt to summarize every point of the discussion). In re Reed Elsevier Properties Inc., 77 USPQ2d 1649 (TTAB 2005). 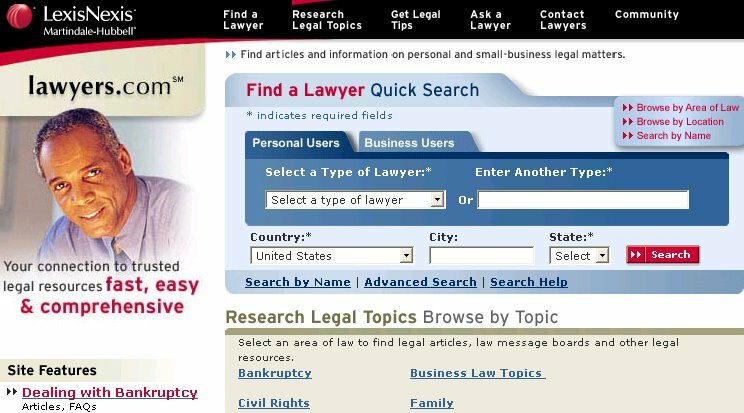 Examining Attorney Kathleen M. Vanston refused registration on the Supplemental Register, relying on definitions of "lawyers" and "domain name," on pages from the websites of Applicant and of others "demonstrating that web sites devoted to law, legal news, and legal services also provide information about and/or databases of lawyers," and on webpages showing use of the domain names www.massachusetts-lawyers.com, www.wrongfuldeath-lawyers.com, and other like domain names for lawyer directory websites. "Under the circumstances we find the genus of services to be providing a web site with a database of information covering the identified topics of law, legal news and legal services and that a central and inextricably intertwined element of that genus is information about lawyers and information from lawyers. " "The relevant public, including both lawyers and non-lawyers, when they consider LAWYERS.COM in conjunction with the class of involved services, would readily understand the term to identify a commercial web site providing access to and information about lawyers." The Board therefore deemed the term LAWYERS.COM to be generic for Applicant's services. TTABlog note: The Board cited the BLINDSANDDRAPERY.COM case, decided earlier this year (discussed here at the TTABlog), but it did not cite the very recent, and somewhat similar SPORTSBETTING.COM decision (blogged here). It distinguished the Federal Circuit's s STEELBUILDING.COM decision (blogged here), pointing out that "special circumstances" there led to a determination of non-genericness. Text Copyright John L. Welch 2005.